PyLocky ransomware uses sophisticated techniques to infiltrate computers and hide from its victims. Use Reimage to determine whether your system is infected and prevent the loss of your files. Locky Locker is a ransomware which is considered to be an imposter of the original Locky virus. PyLocky ransomware is a dangerous cyber threat which is designed to use the combination of AES and RSA ciphers to encrypt most widely used files on the targeted computer. Security researchers note that this file-encrypting virus is an imposter of the infamous Locky ransomware. Once the virus infiltrates the system, it marks the encoded information with one of these extensions: .locky, .lockymap, .lockedfile. As a result, it becomes unusable. Victims also receive LOCKY-README.txt ransom note which informs them about decryption solution and demands to pay the ransom in Bitcoins. Alternatively, this infection might use the name of Locky Locker ransomware and reach the system as lock.exe or Facture_25.07.2018_991030.exe files. 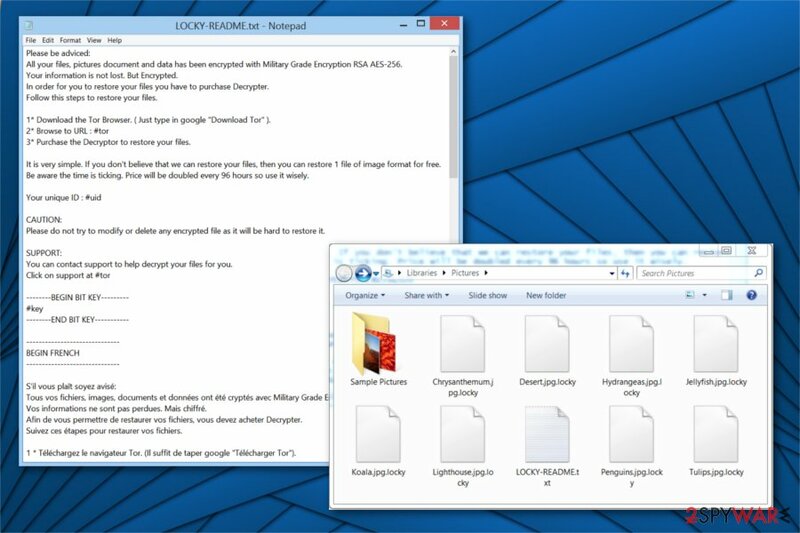 In August 2018, PyLocky virus came out with the new version that contains .lockedfile extension. The malware is actively targeting France with the help of spam sent from ouisorties[. ]fr service. However, this latest version is available in four different languages in total: English, French, Italian and Korean. Usually, PyLocky ransomware might reach the systems if the user opens a malicious email attachment with the payload of the virus. Afterward, the crypto-malware starts encrypting information on the affected computer and makes it unusable. After the successful encryption this ransomware places ransom note in every system folder, that contains encrypted files. 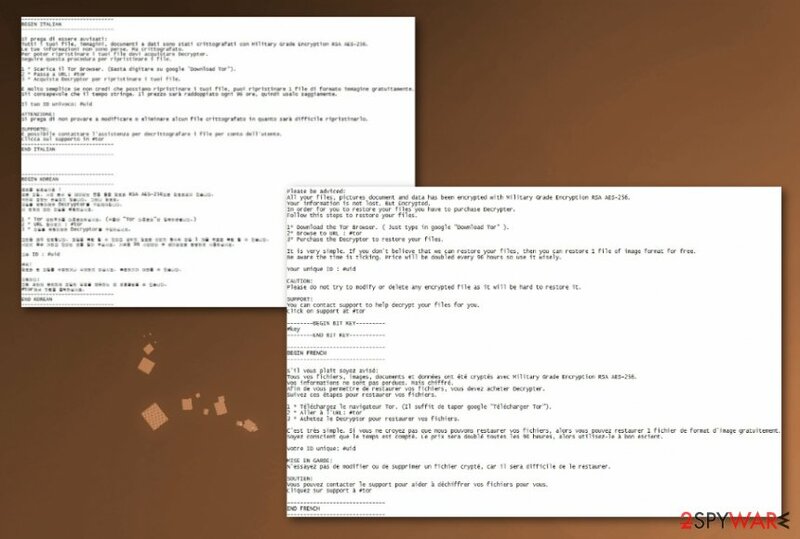 The most recent version of this PyLocky ransomware uses a ransom message written in four different languages. Starting the message with English and then following with versions in French, Italian and even Korean. All your files, pictures document and data has been encrypted with Military Grade Encryption RSA AES-256. Your information is not lost. But Encrypted. In order for you to restore your files you have to purchase Decrypter. Follow this steps to restore your files. 1* Download the Tor Browser. ( Just type in google “Download Tor” ). 3* Purchase the Decryptor to restore your files. It is very simple. If you don't believe that we can restore your files, then you can restore 1 file of image format for free. Be aware the time is ticking. Price will be doubled every 96 hours so use it wisely. Criminals inform that user's data is encrypted with military-grade algorithms and one must pay the ransom for Locky Locker decryption software. The victim must download the Tor browser and purchase the decryptor with Bitcoins. These precise instructions allow the hackers to remain anonymous as the illegal transactions cannot be traced back to the attackers. However, experts strongly advise PyLocky ransomware victims not to pay the ransom. Even though it might seem intimidating as criminals indicate the price of decrypter is doubled every 96 hours, there are alternative ways how you can get back your data. Additionally, cybercriminals are not the ones you should trust. This virus is alive and updated, so it means that you need to be cautious if you are affected by any version of PyLocky ransomware. The latest variant is targeting France, according to cybersecurity experts. However, even if most of the known victims are from there, there is still an opportunity that this malware spreads around the whole world. PyLocky ransomware is a virus that locks data using sophisticated encryption method. Researchers indicate that in most cases victims are demanded to pay more money once they agree to the initial amount of the ransom. Furthermore, a vast of users are left without the decryption software after the transaction. Thus, you should refrain from paying the ransom and remove PyLocky ransomware instead if you found .lockedfile, .lockymap and similar file extensions added to your data. After PyLocky ransomware removal, you will be able to use alternative data recovery solutions. Our experts have prepared a list of effective tools which can help you retrieve files encrypted by ransomware. Although, you must first eliminate the infection. For that, scan your PC with Reimage or another professional antivirus. PyLocky is a file-encrypting virus which appends either .lockedfile or .locky extension to the encoded data. Those who wonder how their computers got infected with ransomware should be aware of the most prominent distribution techniques which allow the criminals to take over devices. Now, most file-encrypting viruses spread via malspam campaigns. In other terms, hackers obfuscate ransomware payloads as legitimate and innocent files and attach them to spam emails. In most cases, users can receive malicious letters which supposedly come from well-known companies or governmental institutions. Once the attachment of the email is opened, it drops the payload of the malware and starts data encryption. Therefore, users should closely monitor their inboxes and never click on any suspicious files. Additionally, it is wise to employ an antivirus with real-time protection to avoid ransomware attacks. It is essential to understand how dangerous ransomware-type infections are and how important it is to remove PyLocky ransomware in time. Otherwise, this crypto-malware might either encode more essential files or infiltrate the system with more malicious programs. For PyLocky ransomware removal, you must get help from professionals. We recommend installing verified security tools to scan, identify and eliminate ransomware-related components. Researchers suggest using Reimage or Plumbytes Anti-MalwareMalwarebytes Malwarebytes as they are easy-to-use and completes the procedure within several minutes. After you uninstall PyLocky ransomware, you can head to data recovery. Note that there are professional programs which are designed to help crypto-malware victims. The instructions on how to use alternative decryption tools are presented at the end of this article. Log in to your infected account and start the browser. Download Reimage or other legitimate anti-spyware program. Update it before a full system scan and remove malicious files that belong to your ransomware and complete PyLocky removal. When a new window shows up, click Next and select your restore point that is prior the infiltration of PyLocky. After doing that, click Next. Once you restore your system to a previous date, download and scan your computer with Reimage and make sure that PyLocky removal is performed successfully. Guide which is presented above is supposed to help you remove PyLocky from your computer. To recover your encrypted files, we recommend using a detailed guide prepared by 2-spyware.com security experts. This tool is designed to recover data if it has been accidentally deleted or compromised in other ways. If System Restore function has been enabled before malware attack, users can travel back in time and get back the access to encoded data. This software uses Shadow Volume Copies to recover encrypted information. If PyLocky ransomware hasn't deleted them or corrupted in other ways, users are advised to try this tool. Locky Locker decryption software is still under-development. ^ Contel Bradford. 5 Common Encryption Algorithms and the Unbreakables of the Future. Storagecraft. Data protection and recovery experts. ^ Thorin Klosowski. What Is Tor and Should I Use It?. Lifehacker. Do everything better. ^ UdenVirus. UdenVirus. Security and Spyware News. This entry was posted on 2018-09-04 at 03:27 and is filed under Ransomware, Viruses. You can quickly scan the QR code with your mobile device and have PyLocky ransomware manual removal instructions right in your pocket. How did you remove PyLocky virus?